Having booked into the Blackwater Hostel, we were (unusually) sharing this weekend with other folk (not that we're anti-social in any way) - most of whom we never saw at all apart from one very keen gang of West Highland Way walkers who were all up and at 'em fairly early on on Sunday morning. We did, however, hear some of the other residents. With ear-plugs in, needless to say, I never heard a thing, but apparently some young lads, doing the WHW north to south, had a few sherberts on the Friday night and after a few more at the pub, came back to the hostel for even more. One of them then fell out of his top bunk, an ambulance was called which arrived at 4am and the injured party was then carted off to the hospital where he was kept in for "observation". His uninjured pals were then politely asked to leave, having trashed their room. Turning to the hills, Saturday morning was glorious - everyone was in extremely high spirits and extra sandwiches were made. 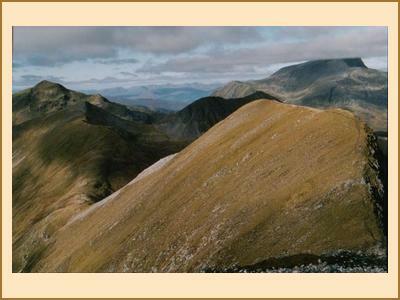 Throughout the day several combinations of Mamores were climbed with Martin talking the gold medal. I'd heard him say he'd start on Sgurr Eilde Mor and "see how he got on". Well, he got on very well as he climbed the lot. Alan and Anne had a great day on the Aonach Eagach, finishing on the Pap of Glencoe, another gang did the two Munros at Glenfinnan and I did a Corbett in Glen Etive. Saturday night involved battling with the locals for seats in the pub and trying not to get mown down by a plethora of bikers who were in Kinlochleven for some kind of (large and pretty noisy) rally. Still, the food in the Highland Gathering was really great and the beer at the pub wasn't bad either. Weather held out on Sunday so yet more combinations of the Mamores were done, Grahams were climbed in Ardgour, Ballachulish and from Callert House. 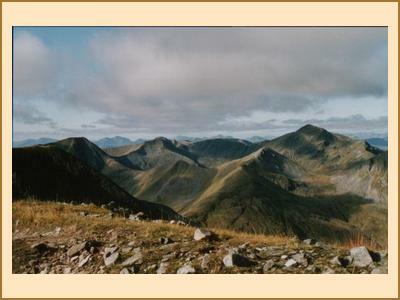 Bill, Eileen and Tim went off to climb Beinn a' Bheithir where I think Eileen was hopeful of meeting an avatar - for those that don't know, an avatar is some kind of spirit guide, or according to the dictionary "the appearance of a god in human or animal form". Margaret, thinking someone had said aviator, was hopeful too. Not sure what the outcome was, but I suspect they were all more than likely disappointed.